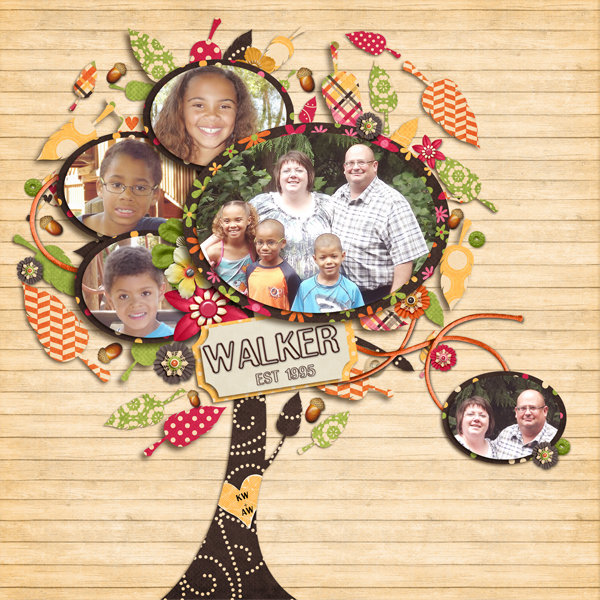 Sneak Peek – Friends and Family!!! Hi Bella Gypsy fans!!! Elizabeth here bringing you this week sneak peeks!!! 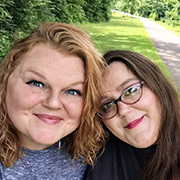 This week Lena and Tabatha have TWO brand new releases!! If you’d like a chance at winning one of these beautiful kits Just leave us a comment for a chance to win. Wednesday nights at 9 pm EST I’ll choose two winner (one winner for each kit) using random.org and email the lucky person links to download the kit before it’s available for sale! 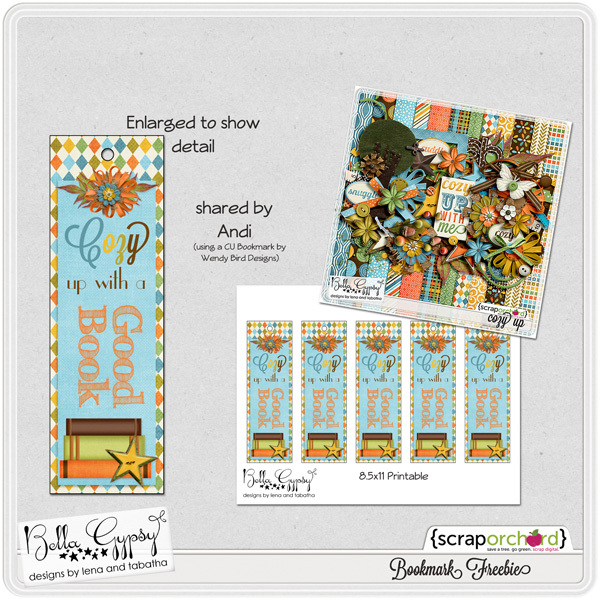 Hiya friends, it’s Andi, bringing you another Tuesday freebie and sharing some fabulous goodies from Bella Gypsy Designs. Falling is perfect for all things Autumn, from pumpkin patches & pumpkin carving, to falling leaves and family portraits. This kit is chock full of gorgeous bright colors, flowers, and amazing papers for your stash of Fall photos, and it is on sale at 20% off. Now for your Freebie, which matches perfectly with the cellphone wallpaper from Friday’s freebie. Happy Friday! Can you believe another Friday is here and October is half over already! Fall has come and is almost gone here. The days are getting colder and all the leaves are off the trees. It’s time to rake the leaves, go to the pumpkin patch and get ready for Halloween and other fall activities! 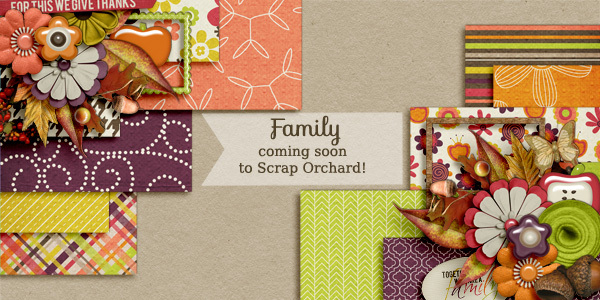 Bella Gypsy has a new, beautiful fall kit that was released today at Scrap Orchard that is perfect for scrapping pictures from this time of year. 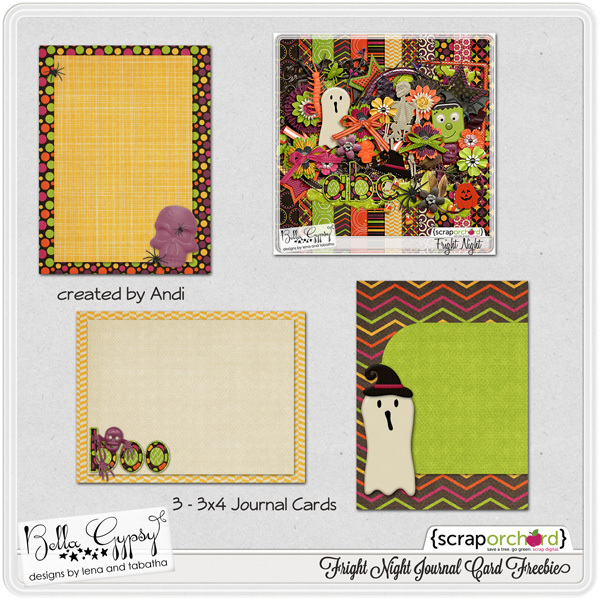 Andi made a freebie for you this week! Here is “cellphone wallpaper” for you! 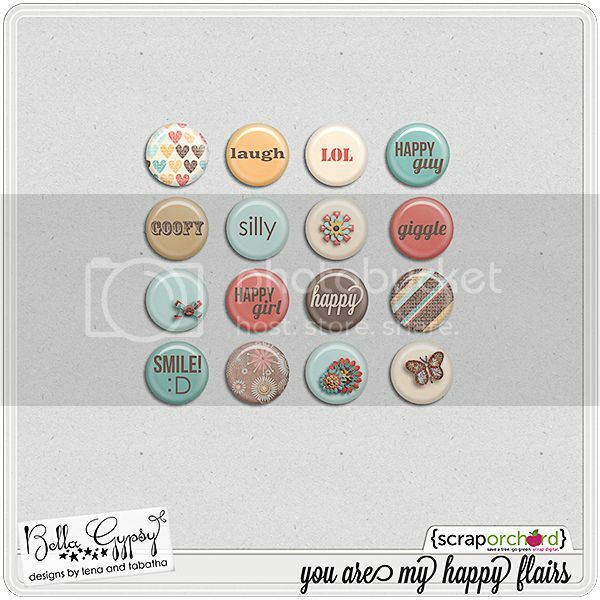 Hiya friends, this is Andi, part of the Bella Gypsy Team bringing you a gorgeous WREATH CLUSTER FREEBIE using Bella Gypsy Designs gorgeous kit “You Are My Happy” available for 20% off at their Scrap Orchard shop. 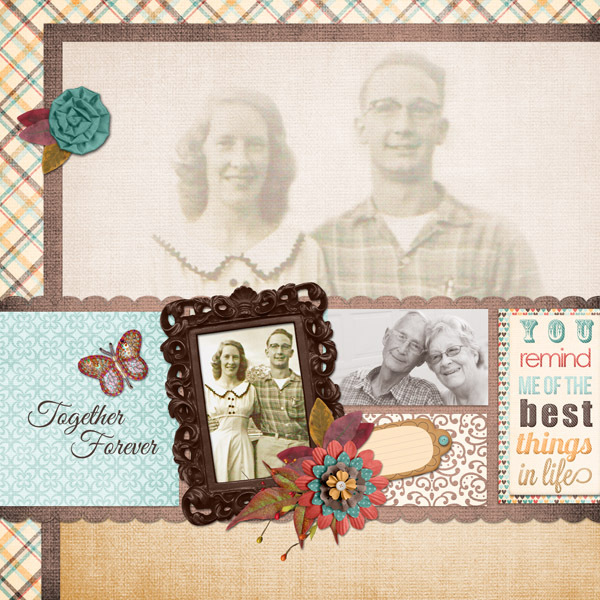 This beautiful kit is sooo inspiring and I created 2 Layouts with it, I just couldn’t help it. It was perfect for these pictures of my in-laws. 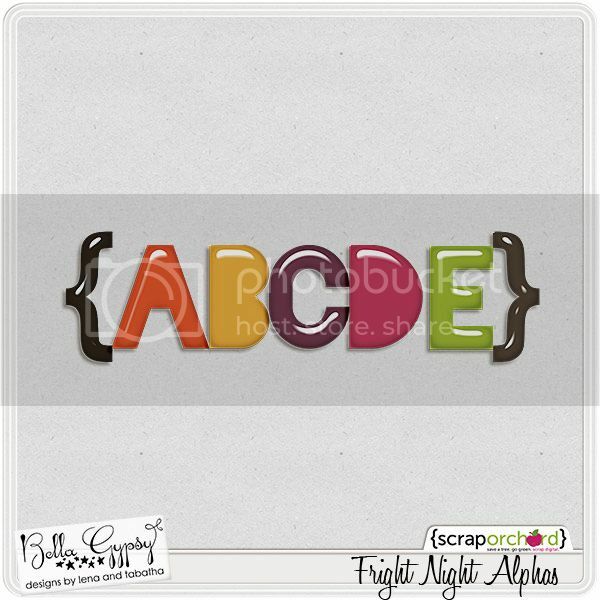 This freebie is available in both shadowed and non-shadowed options. Enjoy. Do you have that special someone that always makes you smile? Someone that is your happy in life? 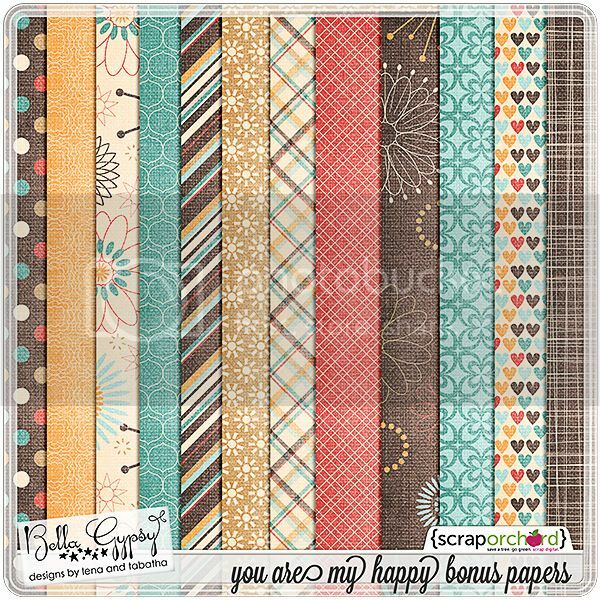 If you do, then check out the newest bundle hitting Scrap Orchard this week! I mentioned I had a headache….well, I had a bit of an accident this week (landed myself in the ER and have to have my head glued back together) and my computer time was VERY limited due to it. I didn’t have a chance to make a freebie this week but I promise I will make it up to you next week! Lena here with some news! We’ve been hosting the Sneak Peek giveaway every week on Facebook. After reviewing Facebook’s TOU Agreement closely we’ve determined that it would be better for us to host this here on our own site. We value Facebook as a tool for our business and we’d never want to get in trouble for violating their terms. Hosting a giveaway would be best done here! So, every Wednesday we’ll post a peek here of the new kit. Just leave us a comment for a chance to win. Wednesday nights at 9 pm EST I’ll choose a winner using random.org and email the lucky person links to download the kit before it’s available for sale! Hiya friends. I hope you’re all doing wonderful. 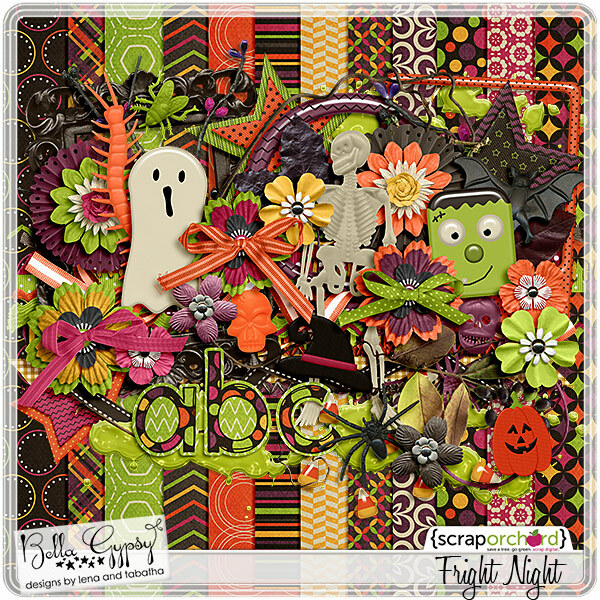 Today I have some Journal Cards to share with you using the fabulous “Fright Night” kit by Bella Gypsy Designs. 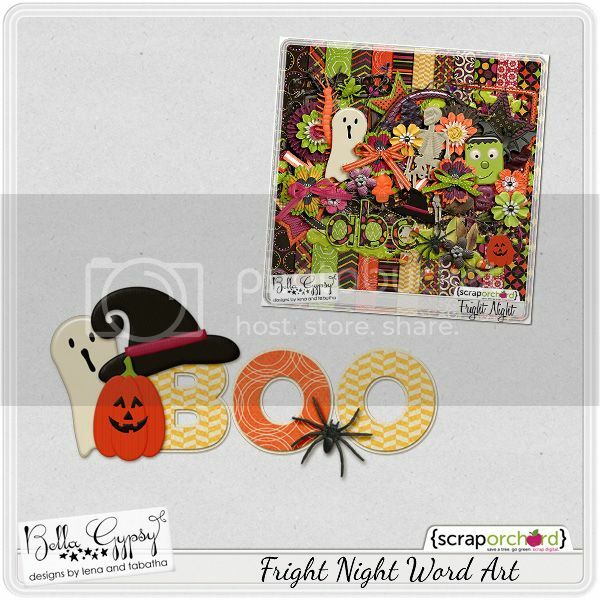 With tons of slime, skeletons, spiders, a pumpkin, the cutest ghost ever, gorgeous papers, and amazing colors, this is a must-have kit for all things Halloween! 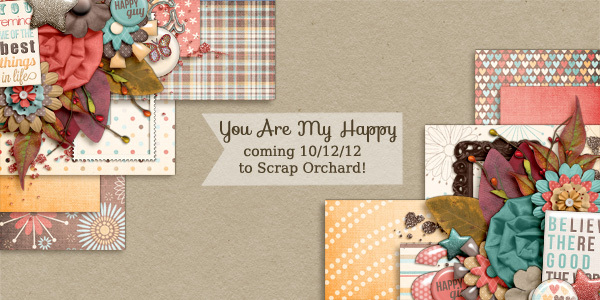 Head to Scrap Orchard to purchase this kit for 20% off today! YAY! 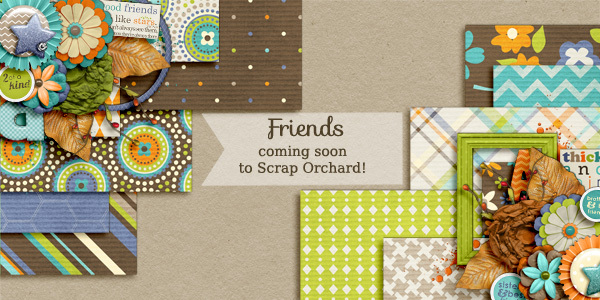 Another Friday is here and that means there are some awesome new goodies hitting the Bella Gypsy store over at Scrap Orchard. It’s Kim here on this fabulous Friday to bring tell you all about the new stuff! October is here (I really can’t believe I just said that) and that means Halloween is right around the corner. It is time to stock up on candy and hunt for the perfect costume. If your children are anything like mine, they change their mind 100 times before they actually decide on a costume. This year was painless though…we have had their costumes for a month…the first costumes they saw they HAD to have! EASY PEASY this year! 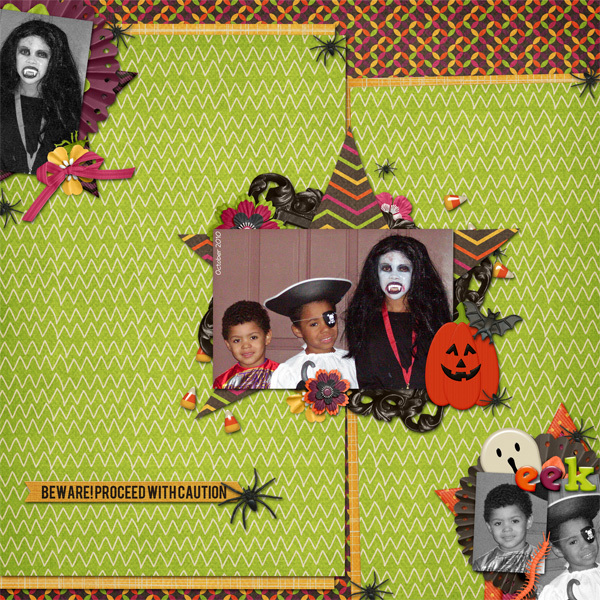 If your children go trick or treating or have a fall party at school, I am sure you will be taking lots of pictures. 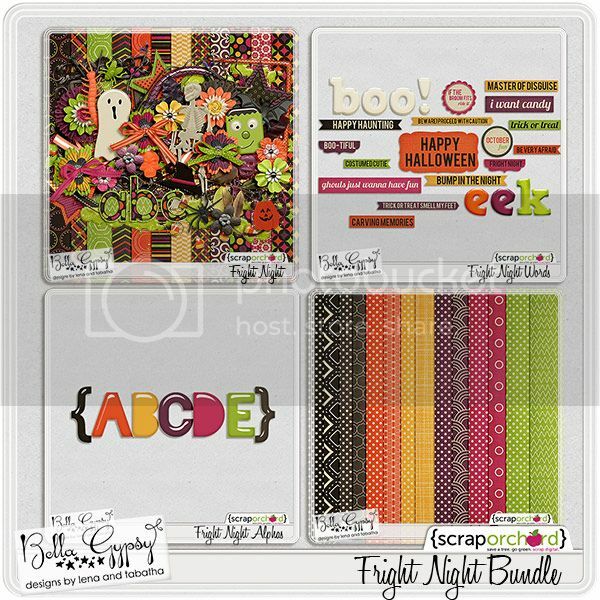 Bella Gypsy’s new kit will help you scrap all those BOO-tiful memories of Halloween this year! 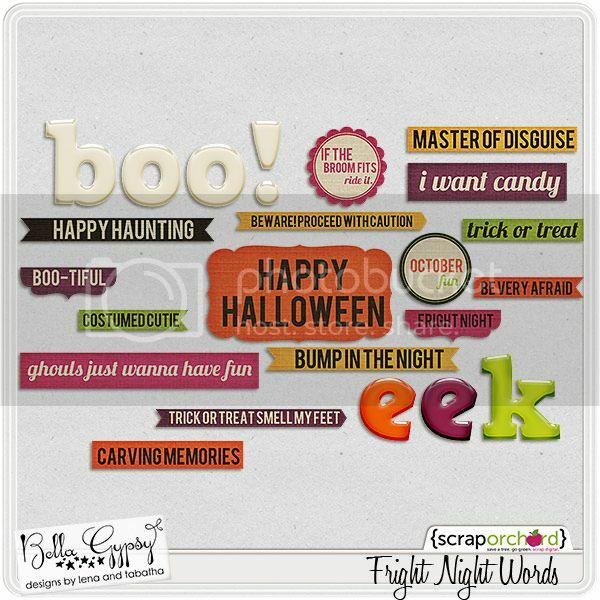 Check out Fright Night! Here is the entire collection. And here is a closer look at each package! You can purchase each package separately or purchase the bundle. I also made a freebie for you. You will find the download link below the preview. I hope you all have a fantastic weekend! See you next Friday with another awesome, new collection! Hiya friends, this is Andi, part of the Bella Gypsy Team. I’m so happy to be here today sharing one of my favorites. 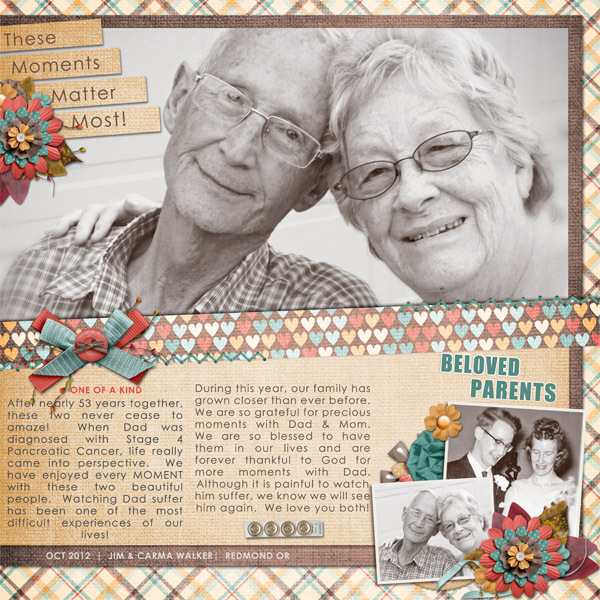 Today I’m sharing a tutorial link I found back in the day when I was first learning my PSE program. In 2008, I was just learning my PSE 7 program, and frankly I was scared to death of it. 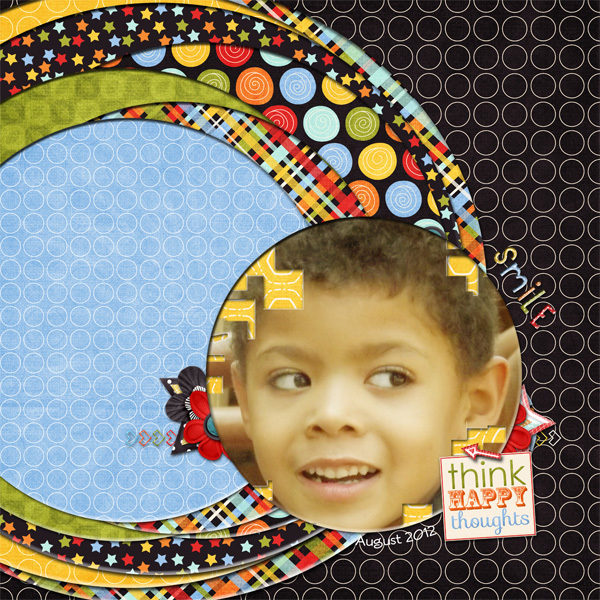 As I searched the web, I found this awesome website called “The Graphic Reporter”, which is now Photo Lesa. Here’s one of the first things I wanted to try. I have since blown up a few pics in my time…LOL. First of all, open your program. Second, we are going to jump websites. Really quickly head over to “Photo Lesa“, just click the link & another tab will open. Now, open your pic and follow the Step by Step tutorial at Photo Lesa for Smashing a Photo into pieces. I was going to my own version of this tutorial for you, but she’s a professional and has already done all the work for us, so go ahead…I’ll wait for you. Are you back? How cool is that? I love it! 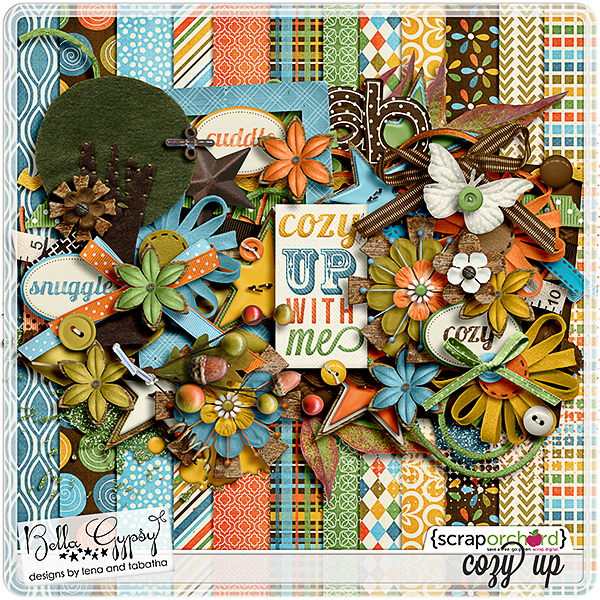 Here is my Broken up pic thrown into a Layout. I love how it turned out. [Here’s a little more in-depth instruction for this LO. I cropped the smashed photo into a circle and created a layer mask over the yellow hexagon paper. Then I wanted it to have nice shadowing and as I experimented, a happy thing occurred as I was goofing off with the “bevels” slider in my effects palette. It was so fun. So my shadows are 20, 9, 78, and my bevel is at 24 and don’t forget to click on the “down” beveled arrow/icon instead of up. Does that make sense? I did this for each of the papers and I just love the look of it. Are you lost? If you have questions and need help, I can create a tutorial for that as well]. Happy Scrapping, and remember to take a minute to work with the bevel & shadows, you might have find yourself learning new things too!